Cet article raconte l'histoire de Trans World Order Affinity Group (TOAG), un groupe féministe, queer et trans qui, dans le cadre du mouvement Occupy, a démarré une plateforme de communication et de technologie en ligne suivant le modèle des logiciels libres, à source ouverte et gratuits. Les membres du TOAG sont sensibles à l'expression des identités de genre qui ne se conforment pas aux normes sociétales, et sont principalement des femmes trans et queers, parmi lesquelles se trouvent des hackers et des journalistes. Ce qui suit est une brève analyse des façons dont le TOAG s’est construit en tant que collectif féministe, queer et trans hors ligne et en ligne. Image : Sophie Toupin, The Gendered-Self Terminal, 2013. The Trans World Order Affinity Group (TOAG), a tech and communication hub within the Occupy Movement, composed mostly of self-identified women and queer, was initiated in July 2011, when one of its founding member, registered the OccupyWallSt.org site. 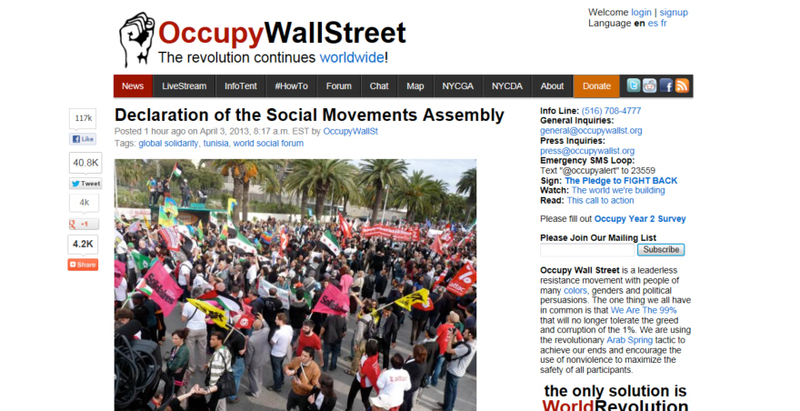 Shortly before, Adbusters, the Canadian countercultural magazine, had bought the OccupyWallStreet.org domain name before launching its call to “Occupy Wall Street (OWS).” Its call asked 20 000 people to “flood into lower Manhattan, set up tents, kitchens, peaceful barricades and Occupy Wall Street for a few months”. During the summer of 2011, the spirit of encampment was well underway as a handful of activists prepared relatively out of sight their “occupation”. This article focuses on the TOAG’s hub as an example of an online endeavour that not only captured what Occupy was all about, but also attempted to make its discourse and narrative more sensitive to feminist, queer and trans issues. While doing research on the relationship between online and offline feminist contributions within the Occupy Movement, I encountered the TOAG’s endeavour. I quickly grew fascinated by this feminist, queer and trans affinity group that I perceived as attempting to craft a particular kind of online/offline praxis. This article is based on interviews conducted with some of the TOAG members, in addition to my own analysis of their online and offline praxis. I want to stress that this account is situated by own particular positionality, contributing a “partial truth” to a larger body of feminist/queer/trans and critical ethnographic work on online/offline praxis. The TOAG’s communication and tech hub is of particular interest for multiple reasons. First, it helps to better understand trans, queer and feminist subcultures on the Internet and their influence within a movement such as Occupy. When the TOAG online platform was set up, it was envisioned to function as a mobilising tool to connect activists in New York and beyond. But, because its popularity grew exponentially in a matter of weeks providing crucial information on what was happening on OWS and beyond, their influence also grew changing their role and function within the movement. Basically we created this website and we never claimed to be the website of the movement, because this is a movement of many leaders. Some mainstream media picked up on our website as the official website. We ended up being put in somewhat of an uncomfortable position […]. And then suddenly we became the public face of the movement. While continuing to give updates on the encampment and related activities, they also started to highlight the importance of considering intersectional issues within the encampment and the larger narrative presented by OWS. I think we succeeded in broadening the discourse to not only talking about the rich, but also talking about social justice issues such as trans-rights, and organising around issues of police brutality, community issues, people of color issues, poor people issues […]. To understand the TOAG’s feminist, queer and trans inflection, it is useful to look at the composition of its collective, which draws from those sensitive to non-normative gender expression, mostly comprising self-identified women and queers, among whom are journalists, hackers, and other social media savvy individuals. Half of us are trans. Two of us are cisgender men, and one is a cisgender woman. That’s very different than with other tech groups who are generally white men. The TOAG’s name and structure are also vital for helping to better understand an online subculture. Their name largely came out of a spirit of playfulness, well known among hackers, but also, among queer and feminist whose online practice have changed over the years from earnest outrage to developing into funnier and snarkier critique. Nonetheless, their name highlights their desire for an end to transphobia within social movements and society in general. Graduate Student Micha Cardenas spent 365 consecutive hours immersed in Second Life in a project called Becoming Dragon. The project and the number of hours spend online comes from a desire to question the psychiatric requirements transgendered people ought to fulfill before getting gender confirmation surgery in the USA. The TOAG formed as a collective involving like-minded individuals and friends. They also portrayed themselves as an affinity group within Occupy Wall Street rather than a working group: “We were A tech group and not The tech working group.” Early on, their collective decided not to be located in Zuccotti Park. With some of its members having struggled against the stigma associated with being a transwoman and coupled with the difficulty of operating a communication and tech hub outdoors, the TOAG decided to act out of an apartment in Brooklyn. Sharing a squatted apartment also strengthened their affect and collective commitment to the project. Despite the challenge of largely being out of the park’s sight, the TOAG remained an important voice countering gender oppression, while fostering intersectional issues within Occupy itself, and also outside of it. I think we applied an intersectional analysis. We understood that we all needed to fight racism, sexism, transphobia and so we tried to build a movement of people who wanted to fight these oppressions. We told people that their struggle is our struggle. And that we will fight together for everything at the same time. Individuals, like some of the TOAG members, who could not (due for instance to lack of time or being undocumented) or did not feel at ease to be in Zuccotti Park could somewhat experience a sense of agency through virtual participation, online journalism, computer programming or hacking. Being out of sight, while still being active in the online realm, was a practice the TOAG adopted to answer some of the personal challenges they faced. Essentially we are bloggers. So that’s what protected us. None of us participate in direct actions, we might tweet about it, write about it, we might announce it on our website, but we don’t even go. And that has something to do [with being] transwomen and the repression that we potentially face within the criminal justice system. We don’t feel we are arrestable for our own mental health and the situation we would encounter there [in prison]. 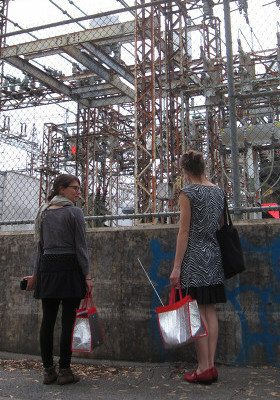 As part of their practice was also the attempt to embrace virtual collective agency. To do so, they put forth a collective voice by, for instance, never attaching individual names to articles they wrote. This way they tried to ensure online and offline safety for members of their collective, while sharing a potentially emotional burden associated with online attacks. It was also a way to embody a collective voice. We never used our names, we never wanted credit. For us it was about the movement, it was not about us. Unfortunately some people use that to get credit and the mainstream media wants to attribute credit to individuals. 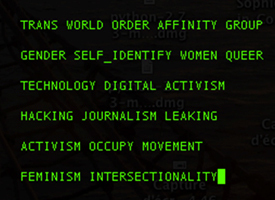 The TOAG’s feminist/queer/trans online praxis was somewhat influenced by cyber and techno feminist approaches where a safe space took prominence both online and off. Offline they had a collective of like-minded individuals they could rely on, while online they foregrounded a collective voice and had explicit rules on how to behave online. They would, for instance, delete any sexist, racist and transphobia comments appearing on the Occupywallst.org platform. Their approach was also reflected in the design of their platform which used free/libre/open source software and connected many online platforms and services (chat, forum, livestream, etc.) together. Their endeavour was also explicitly dedicated to technical and journalistic support work for a resistance movement such as Occupy. Up to this day, the platform is still up and running in supporting Occupy offshoots in addition to other social movements around the world. However, and contrary to a certain stance among hackers, the TOAG accepted to use corporate social platforms such as Twitter and Facebook as a way, they argued, to reach out to a wide audience. All and all, the TOAG’s endeavour as shortly described and analysed above, demonstrates the importance of having communication and tech hubs with a feminist, queer and trans inflection that work with and for social movements. In referring to the importance of diversity of practices within the hacker community, Gabriella Coleman highlights the value of “proliferating differences rather than destroying them”. The fact that a communication and tech hub might somewhat help influence the inclusiveness within the discourse of a social movement, by pushing for feminist, queer and trans narratives is indicative of their value. The TOAG’s endeavor, which is located at the intersection of feminist/queer/trans and hacker cultures, might also inspire groups to start projects along the same lines. And in the end, the involvement of more hackers with feminist, queer and trans perspectives, and vice versa, might help create a distinct subculture of feminist, queer and trans hackers and a specific mythology associate with them. The Trans*H4CK, a Hackathon for Transgender Empowerment, is an example of an open tech project aimed at benefiting the trans and gender non-conforming community. 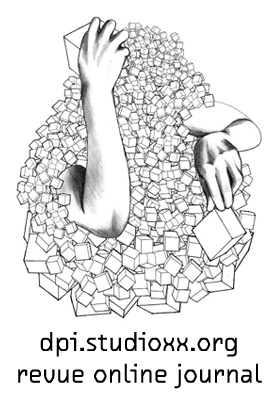 The hackathon was organised on September 13-15th, 2013 in Oakland, California. Three months prior to the launch of OWS, on September 17, The New Yorkers Against Budget Cuts had set up the Bloombergville encampment in front of the New York mayor’s office to oppose the city’s budget cuts. Also, in Washington DC, a group was preparing an action set for October 6 to seize DC Freedom Plaza in the spirit of non-violent resistance similar to the Arab Spring, the M15 Movement in Spain and the Midwest Awakening (See Walkerville Occupation in Wisconsin). For more information, see Gerbaudo, Paolo. Tweets and the Streets: Social Media and Contemporary Activism. London: Pluto Press, 2012. This short article is based on larger study conducted on the feminist and queer practices within Occupy Wall Street. To read the in-depth article, see: Ng, Eve, and Sophie Toupin. “Occupy and Feminist Practice: A Case Study of Online and Offline Activism at Occupy Wall Street.” Networking Knowledge: Journal of the MeCCSA-PGN, Special issue: Protest and the New Media Ecology (Forthcoming, November 2013). [v] Clifford, James. “Introduction: Partial truths.” In Writing culture: The poetics and politics of ethnography, edited by James Clifford and George E. Marcu, 1–26. Berkeley: University of California Press, 1986. Member of the Trans World Order Affinity Group, personal communication, November 21, 2012. Ng, Eve, and Sophie Toupin. 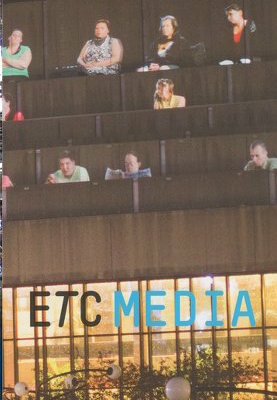 “Occupy and Feminist Practice: A Case Study of Online and Offline Activism at Occupy Wall Street.” Networking Knowledge: Journal of the MeCCSA-PGN, Special issue: Protest and the New Media Ecology (Forthcoming, November 2013). See Coleman, Gabriella. Coding Freedom: The Ethics and Aesthetics of Hacking. New Jersey: Princeton university Press, 2013. [16 Ng, Eve, and Sophie Toupin. “Occupy and Feminist Practice: A Case Study of Online and Offline Activism at Occupy Wall Street.” Networking Knowledge: Journal of the MeCCSA-PGN, Special issue: Protest and the New Media Ecology (Forthcoming, November 2013). See Haraway, Donna. Simians, Cyborgs and Women: The Reinvention of Nature, New York: Routledge, 2001 and Plant, Sady. Zeroes and ones: Digital women and the new technoculture. New York: Doubleday, 1997. Wajcman, Judith. 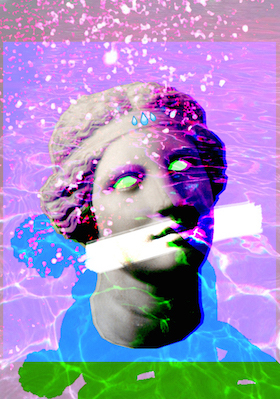 Technofeminism. Cambridge, UK: Polity, 2004. Sophie Toupin est chercheure indépendante. Ses recherches portent sur la relation entre les pratiques féministes en ligne et hors ligne au sein des mouvements sociaux. Elle est passionnée par la radio communautaire, les médias indépendants et participe activement à FemHack (a.k.a FouFem), un hacker-maker space à Montréal.